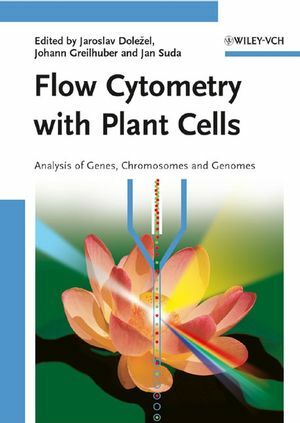 Targeted at beginners as well as experienced users, this handy reference explains the benefits and uses of flow cytometery in the study of plants and their genomes. Following a brief introduction that highlights general considerations when analyzing plant cells by flow cytometric methods, the book goes on to discuss examples of application in plant genetics, genomic analysis, cell cycle analysis, marine organism analysis and breeding studies. With its list of general reading and a glossary of terms, this first reference on FCM in plants fills a real gap by providing first-hand practical hints for the growing community of plant geneticists. Jaroslav Dolezel is the Head of the Czech Institute of Experimental Botany in Olomouc, and Associate Professor at the Palacky University in Olomouc. He has pioneered the use of flow cytometry in plant science for the analysis of nuclear genome size and regularly holds international training courses on the subject. Johann Greilhuber is Associate Professor at the Institute of Botany at the University of Vienna. He has studied plant genomes for almost 30 years and is an expert on intraspecific variation of genome size. He has constantly been developing novel techniques to study plant genomes, among them many methods based on flow cytometry. Jan Suda heads the laboratory of flow and image cytometry at the Czech Academy of Sciences' Institute of Botany. He is a taxonomist specializing in plant biosystematics, including genome size determination and has co-authored a book on taxonomy analysis.